On Sale Now! Save 7% on the Dallmayr Gourmet Coffee, Prodomo (Ground), 8.8-Ounce Vacuum Packs (Pack of 3) by Dallmayr at Rat Coffee Shop. MPN: 00606895. Hurry! Limited time offer. Offer valid only while supplies last. Dallmayr Prodomo Ground coffee Net weight 8.8oz/250g Dallmayr Prodomo is a superior blend of the finest coffee varieties grown in highland regions. Dallmayr Prodomo Ground coffee Net weight 8.8oz/250g Dallmayr Prodomo is a superior blend of the finest coffee varieties grown in highland regions. 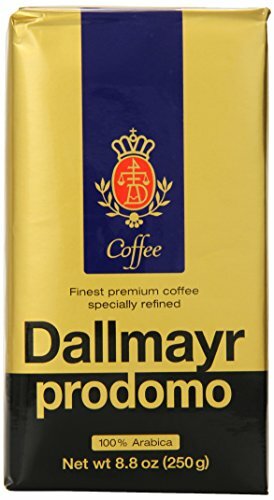 Dallmayr Prodomo Coffee is specially processed to remove irritants and bitterness while retaining its full measure of stimulating caffeine. Thus, for those who are sensitive to the irritating effects of coffee, Dallmayr's Prodomo coffee is a great enjoyment. The Dallmayr "full flavor" roasting process brings out the unique Prodomo taste. If you have any questions about this product by Dallmayr, contact us by completing and submitting the form below. If you are looking for a specif part number, please include it with your message.